Install went fine, and I decided to upgrade to the latest patches using esxcli since the hosts had no access to vCenter. All went fine till after the reboot. I noticed all Broadcom nics where missing from my hosts, most likely due to a driver issue, so time to investigate. As you can see the hosts has 6 nics, four using the Broadcom bnx2x driver and two using the Intel ixgbe driver. 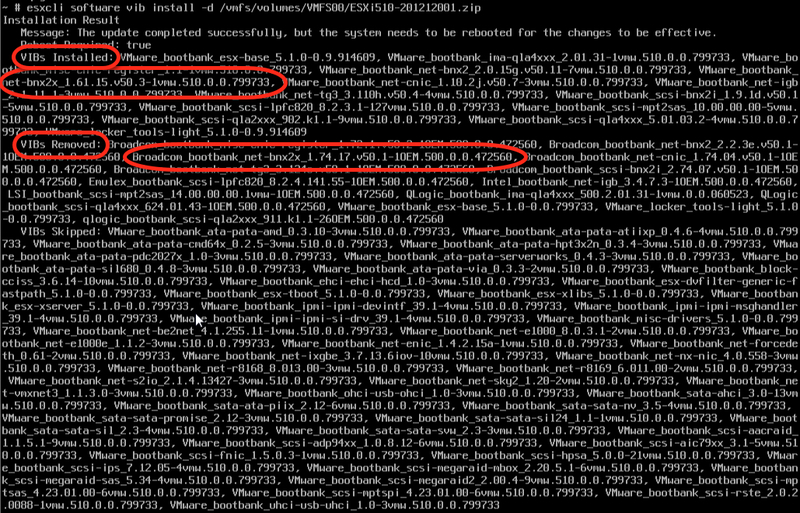 As you can see, the 1.16.15.v50.3-1 drivers are installed and the 1.74.17.v50.1-1 drivers are removed. The good thing is I always try to use nics of different vendors in my hosts, to prevent catastrophic issues with drivers like these. So my hosts still had access to my iSCSI array trough one of the intel 10Gb nics, and I could access the console via the Dell iDRAC. After a reboot my host was back online and connectivity was restored. This entry was posted in Issues and tagged 1.16.15.v50.3-1, 1.74.17.v50.1-1, Broadcom, connectivity, Dell, esxcli, ESXi, ESXi510-201212001, nic, R620, Upgrade by Duco. Bookmark the permalink. Nice article Duco. I’ve read about these issues before, specifically be careful with OEM VMware installation cd’s:)…like the Dell one, but same counts for other vendors. Great timing, I just ran into this issue yesterday on a new server build, and this article saved me a lot of troubleshooting time. In my case, it was the Broadcom tg3-3.129d.v50.1-1013484.zip driver that did the trick. Thanks for the write-up Duco! Nice article Duco, next week I must upgrade the Dell R620 with Broadcom cards insite. So I’am prepared. Thanks so much for posting this. VMware sometimes just boggles my mind with the stuff they do. 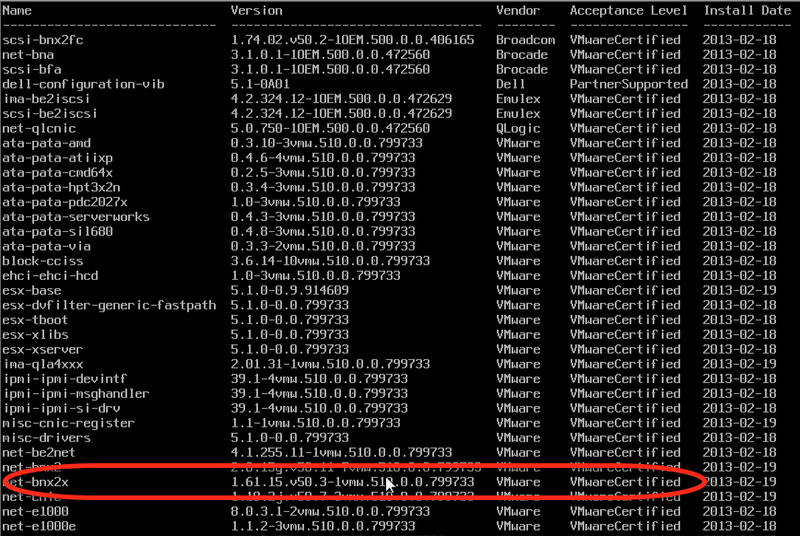 Try following command to update your ESXi. It’s safe. If you enter “esxcli software vib install -d “, customised driver will removed. Thanks Mass, good spot. Still strange though it installs an older driver, but think what you say makes sense.